Catch up with Saturday's action here and the FA People's Cup first-round highlights on the iPlayer. Semi-final highlights will be on the Red Button and Online on Saturday, 30 March at 17:30 GMT on the iPlayer afterwards. And that's all from us for today - continue to follow the conversation using #FAPeoplesCup on social media. Remember, you can watch the full highlights of this weekend’s action on BBC Red Button and Online at 17:30 GMT on Saturday, 30 March. All 98 winning teams will now head to the finals weekend on April 27-28 at St George’s Park – we’ll also be back then with live coverage throughout. We'll leave you with some of the best bits from this weekend. Goodbye! Lovely sentiment from Abdullah here. Surely that guy on the left should be playing for WZG?! And we're all done here in Manchester. Instant Noodles come out on top against Up The Said and are on their way to St George's Park for the Finals. It ended 2-2 at full-time, with Instant Noodles winning 5-4 in a tense penalty shoot-out. Such a brilliant day watching the semi finals of the #FAPeoplesCup. St John’s Ladies Deaf Football FC were an absolute joy to watch. Their team work was effortless and beautiful to witness. They even gave their opponents, Kent Ladies, a member of their own team because they were a player down. Thanks to Kempston FC for being brilliant hosts. From the free cups of tea to the heavenly aura of their burgers & pies! #FAPeoplesCup is football at its best. Team work, passion, everyone welcome and everyone having a reet good time.Bring on the finals! I thought WZG were the best team I’ve seen all day at Peterborough but Ball Park showed up in the final. Energy, great goalkeeping and a whole load of skill, especially the third goal (see below - it's well worth a watch!) in their 4-0 victory. Deservedly off to St George’s Park. We're not far from the end of this weekend's live text of the FA People's Cup, so let's reflect on what a couple of days it has been. League One leaders Luton Town showing their appreciation on Twitter for the LTFC Community Trust team. gr75 Bad day at the office at the #FAPeoplesCup for the @coatsandgoalposts familia. Even this Escher-esque new goalkeeper kit didn't manage to confuse the opposition enough. The two finalists - WZG and Ball Park - are ready to kick-off but we're waiting for the ref who has gone walkabouts! Who will book their place at St George's Park? The goalkeepers are starting to come out on top here in Peterborough. These are two great saves from the EVO and Ball Park 'keepers. It wasn't enough for EVO, however, as they are knocked out. Has anyone got a spare keeper? Email Message: We have a team at the University of Sussex who are a great bunch of guys who are all part of the Geography Society at the University and have formed ABCDE FC (aka 'Team Name FC'). They all come from different backgrounds but the one thing they want to do more than anything is just enjoy the beautiful game. Their captain got injured in the warm up of the first round by rolling his ankle trying to take a back heel pen and couldn’t play the rest of the round so he is coming back from injury. Now their keeper has broken his wrist so they are in search of a super-sub goalkeeper. The guys will be action next weekend (there's a late venue in their category) but could we see them at St George's Park for Finals weekend in April? We have a team at the University of Sussex who are a great bunch of guys who are all part of the Geography Society at the University and have formed ABCDE FC (aka 'Team Name FC'). They all come from different backgrounds but the one thing they want to do more than anything is just enjoy the beautiful game. It's make or break for Greetland Goldstars A now. They need eight goals in their final game or they are out. They are intently watching their opposition at the moment. Almost the cheekiest goal you’ll see all weekend. The Ball Park striker has his back to goal and attempts to backheel it in but a great recovery from the Galanate United keeper denies him. A tight game ends 2-2. From inventive lawnmower celebrations to a back-flick and finish that Messi would have been proud of, the semi-finals of the FA People's Cup had it all. Catch up with all the action from day two of the FA People's Cup semi-finals with video clips and the best stories from around the country. Catch up with all the action from day one of the FA People's Cup semi-finals with video clips and the best stories from around the country. 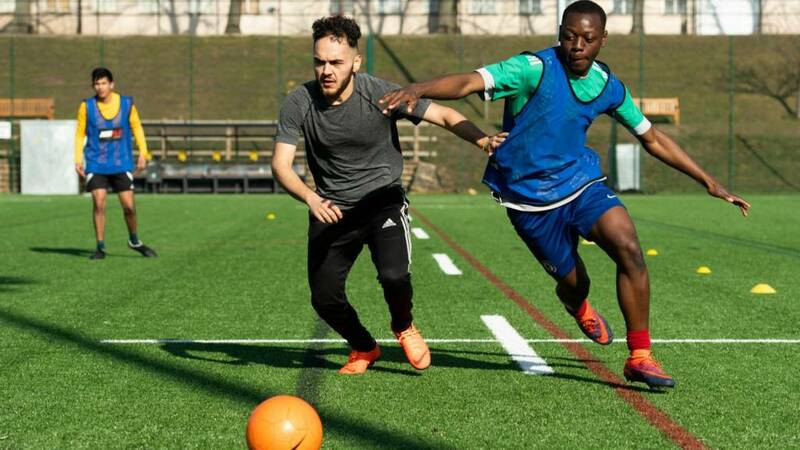 England's Kyle Walker started his career at Football Unites Racism Divides (FURD) sessions - a youth and social inclusion project working to combat racism. Meet Newcastle Panthers - an LGBT+ friendly five-a-side football team from the north-east England - who played in the FA People's Cup.